Nature of Work Performed: Took down leaning tree 105 feet tall leaning over my buildings. Additional Comments: Don Pearl is one of the most honest, reliable, & conscientious persons I know. Additional Comments: Extremely professional and punctual. Additional Comments: Don and his crew did an exceptional job for me - his expertise is very professional. I also liked the way he and his crew left my property - their cleanliness and follow-through was wonderful. I would recommend them to anyone who is in need of their services. Customer Name: John K. P.
Nature of Work Performed: Clearing wooded area and improving road access. Additional Comments: Does very high quality work. Nature of Work Performed: Removing hazardous tree and fire reduction. Additional Comments: Work performed in a safe manner. Customer Name: Mary Joyce P.
Nature of Work Performed: The work was excellent. Glad to get the job done. Additional Comments: My friend Anna Mae and Elaine both used this tree service and both were happy. Nature of Work Performed: Cut 4 trees down. Removed slash and stacked logs in piles so I could cut it for firewood. Additional Comments: Don did an excellent job. I would highly recommend him to others and my friends or relatives. Nature of Work Performed: Cut down 5 large cedar trees, removed slash, stacked logs, arranged for sale and pick up of logs. Additional Comments: Don is conscientious about falling trees in a manner that does not cause damage to property and is good about cleaning up debris from lawns/ He explains what he is doing and is pleasant to work with. Customer Name: Tad M. D.
Additional Comments: Great job - safe. Excellent clean up! Customer Name: Burro Inn/Mark W.
Additional Comments: Overall excellent work. Customer Name: Dave & Sue W.
Additional Comments: Don is great to work with. He knows when to come, even if I don't call. For special needs he is always available. I can always count on him and trust him totally with any job. I highly recommend him in professional skills, attitude, and character. To Whom It May Concern: I have known Mr. Don Pearl for four years (2003-2008). He has been employed by our family to accomplish a number of projects. We have contracted Mr. Pearl to plow our property following each snowfall over 5" to 6" and to shovel the snow off the roof of the house. Over these four years we have contracted him to maintain the upkeep and repair of our house with numerous jobs, such as repairing our roof following a heavy wind storm in which a tree broke causing severe damage; insulating our entire attic; repairing ground squirrel damage to the outside of the house that affected the attic vents; difficulties with the pole building; cutting back trees; repairing our chain link fence; and many other projects that required skilled expertise in many facets of the building trade. Mr. Pearl has always demonstrated a good knowledge of his trade. Don always schedules an appointment and in four years has never been late nor has he ever missed an appointment. He is very dependable. Mr. Pearl always offers an estimate and stays within the quoted price. He is a man of integrity, reliable, and honest; therefore, it is with great pleasure that recommend Don Pearl. Here is the check for the tree work. Thanks for doing it so quickly. Everything looks good, including the clean-up. Thanks again. Give me a call if you have a question. Thanks for the jobs you have done for me. I am very glad to have met you. You're a one in all guy. Hope your family and you do good in your business. Additional Comments: Great job! Don's price was half the price of the nearest bidder. He and his crew make the dangerous job look easy. I will gladly recommend him to my family and friends. Additional Comments: Great job! Don and his crew have done excellent work for my family over the years. We rely on his wide range of expertise for nearly all our needs. He is always friendly and very punctual. All in one guy. Seems to have an easy solution to every problem. Customer Name: John M. & Pat M.
Additional Comments: I have known Don for years. Over that time, we have watched Don's business grow. I believe because of his knowledge, abilities, and efficiency in all the jobs he performs. Me and all my friends and family have employed Don numerour times for all the work we need done in the fields he works in because we know him to be reliable, honest, and hardworking. High quality work and low, fair pricing. I would highly recommend him to anyone. Additional Comments: Don has done many jobs for us. He is knowledgeable of his trades and well rounded. He is a pleasure to work with. His bids have always been way below the other contractors, which has saved us thousands of dollars. Thank you for your service. Good luck. Customer Name: Steven and LeVona B. Nature of Work Performed: Tree removed from between house and power lines & removed maple tree & topped cherry trees, and disposed of brush. Additional Comments: Excellent work. Explained all work to be done. Will be recommending to family, friends, and neighbors! Thank you! Additional Comments: This was the first time Don did tree work for me. He came recommended by a friend and he more than met my expectations. 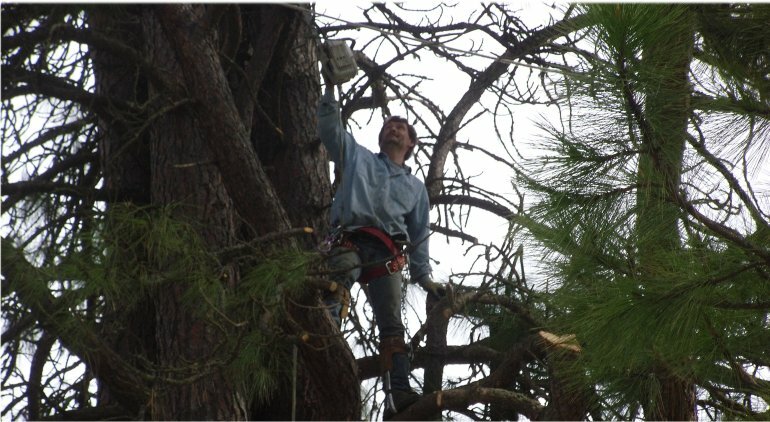 I would not hesitate to have him provide the services he lists, from tree removal to general contracting. Customer Name: Joseph W. H.
Additional Comments: Was very honest and up front with bid and completing job. Customer Name: Norm & Val U. Nature of Work Performed: Trimmed one tree, topped and trimmed another. Additional Comments: Same day service! Good value - added advice. Job performed perfectly (& safely). Excellent clean up. Additional Comments: Don has done several jobs for me. He has always provided excellent service. Very professional service was provided with a friendly attitude. I have recommended him to many of my family and friends. Additional Comments: Good results. Cleaned up after himself. Price was very reasonable. Excellent service. Great experience. Additional Comments: He's a real go-getter. He listens to your needs and tackles the job in a timely manner. I will be using his service in the future. Customer Name: Rick E. B. Nature of Work Performed: Building repairs, snow plowing, tree removal, built a shed for me. Additional Comments: Always on time and dependable! Very fair on pricing the jobs. Honest and professional. I would recommend Donny to any of my friends and family. Additional Comments: Very happy with the service! Customer Name: David and Lois L.
Nature of Work Performed: Removal of hazardous trees from home site. Additional Comments: Highly recommend hiring him for this service - very thorough! Cleaned up excellent after downing trees. Nature of Work Performed: Fell 3 dead trees, limbed up others. Additional Comments: He did a good job and cleaned up after. Customer Name: Ron & Kathy B. Additional Comments: Very efficient and nice clean-up. Additional Comments: Also does snow plowing for us. Nature of Work Performed: Remove dead trees, thin living trees, top infected trees. Additional Comments: Good work, excellent clean-up. Additional Comments: I called Don because my daughter suggested him. He did a very good job. I will be calling him back when I need this type of work done again. Nature of Work Performed: Removal of two trees – Dead cedar and small fire tree. Additional Comments: Would definitely recommend to neighbors and family. Nature of Work Performed: Tree removal. Additional Comments: Don and his crew took great care to remove a tree that was next to my cabin and fence. He placed plywood to protect the cabin, fence, and landscaping. This was a tricky removal and I am very pleased with the work that was performed. Nature of Work Performed: Cut and removed large tree. Additional Comments: Don and his workers were professional and courteous at all times. Don answered all my questions before work, and after it was completed. Great. Nature of Work Performed: Cut big tree and improved driveway. How Long Has Don Been Providing Service To You? 1 Day. Additional Comments: Great guy, great personality, would recommended. Came out shortly after calling, really like that. Clean-up was nice, everything out of the way. Really knew what he was doing! Tree went down just where planned. Customer Name: Dan and Laurie R.
Nature of Work Performed: Tree Removal and Tree Diseases. How Long Has Don Been Providing Service To You? First Time. Additional Comments: Awesome work! Professional quality work, consideration of your property – would definitely recommend, very highly! Nature of Work Performed: Removal and clean-up of 4 trees, including wood and brush. Additional Comments: Hard-working professionals. They did a great job with final clean-up. Nature of Work Performed: Removal of Locust Tree. Nature of Work Performed: Removed a tree. Additional Comments: Professional, fast, and clean-up was excellent. Thank you! Nature of Work Performed: Large, leaning maple tree that had been split and needed to be removed. How Long Has Don Been Providing Service To You? 6 years. Additional Comments: My yard was well protected, plants and lawn were saved. Only one minor divot in the yard. The crew is polite and helpful. I am very satisfied with the work done. Nature of Work Performed: 130' tree removed near house. Additional Comments: Had knowledgeable workers who ensured that damage to the driveway, flower beds, and home was avoided. I highly recommend The Tree Service for tree removal and dead wooding. Nature of Work Performed: 4 trees removed. How Long Has Don Been Providing Service To You? 3 Days. Additional Comments: Very professional and safety aware. Nature of Work Performed: Boom truck work, tree removal. How Long Has Don Been Providing Service To You? 10 years. Additional Comments: Good guy, goes the extra mile to do the job. Very reliable and on time.